These are the best tasting wholesome muffins I’ve ever made. 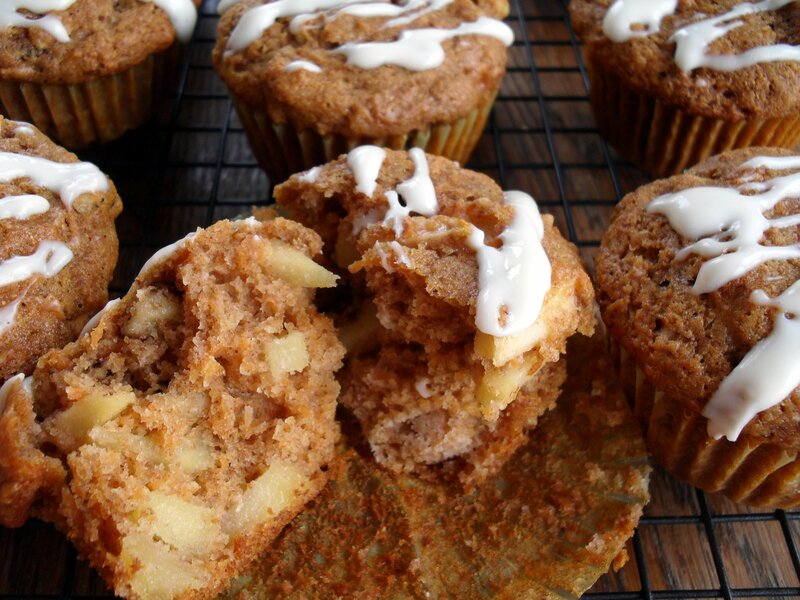 Made with whole wheat flour, honey, apples, carrots & walnuts, they are not only good for you but have a very moist and tender crumb (this surprised me) and are really delicious (this surprised me too). They are so good, in fact, that I replaced my dinner with them tonight! I plan to store them in the freezer and pop one or two into the microwave on busy mornings. I think they’d be wonderful with a cup of black coffee. Preheat the oven to 350F and put paper liners in your muffin pan. Beat together the eggs, oil, milk, honey, and vanilla. In a separate bowl mix together the flours, baking soda, baking powder, cinnamon, nutmeg, and salt. Lightly stir the wet ingredients into the dry, then fold in the carrot, apple, and nuts. Fill the muffin tray (the batter will come up to the top and mound in the center) and bake for 18-20 minutes, or until a toothpick inserted in the center comes out clean. Cool on a wire rack. To make the glaze, warm the Neuchâtel in the microwave, then stir in the honey. Drizzle the glaze over the top of the cooled muffins with a fork, or put it into a Ziploc bag, cut the corner, and squeeze it over the muffins while sweeping the bag back and forth. I very finely shredded the carrots so they're hard to see, but I promise they're there! Posted in Breakfast, Lighter Fare and tagged apple, Breakfast, carrot cake, muffins. Bookmark the permalink. Those look so good. I’ll show this to my husband. He makes some good apple banana muffins. I love carrot cake. 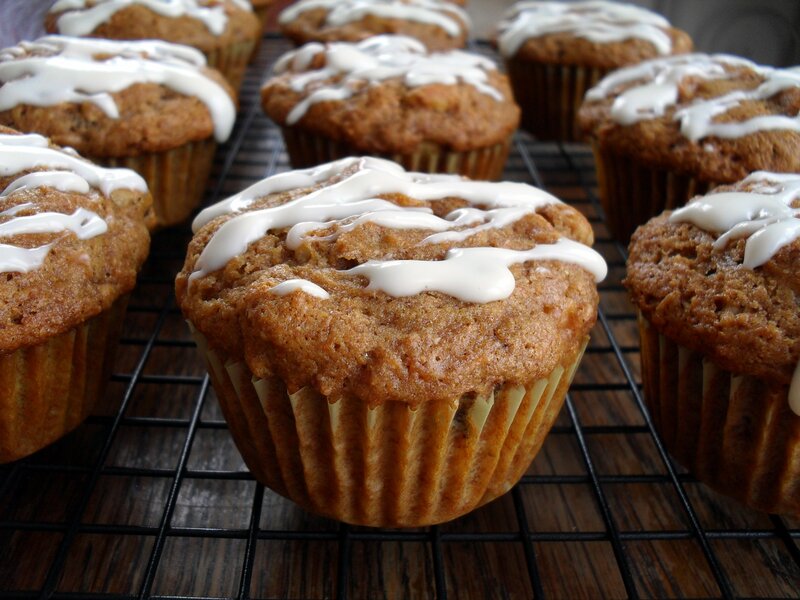 Carrot and apples sound like a nice combo and the icing sounds good and easy too. Thanks for posting the recipe! Your photography is getting so good V. These look great. Yum! MY MOM WOULD LOVE THESE!!! I agree with Laura. Your photos ARE getting better and better! Think I can make these with all whole wheat flour? Yes. In fact, the original recipe calls for all whole wheat flour. I substituted some all-purpose because it gives a finer crumb. All whole wheat would be more rustic. Great recipe, my 7 year old girl loves baking with me and we made this together. I juiced the carrots and used the pulp to make them. We have fun. Thanx. That is so sweet, Wendy! I love to hear about Mom’s baking with their children–I’m glad you both liked the recipe and had fun making it. These are the BEST muffins I’ve ever had! My toddlers would love these! I love the healthy ‘frosting’ idea- definitely gonna have to try these soon! Oh My! These muffins are truly AMAZING!! As a chocolate lover, I always choose a chocolate muffin. Was given a ton of carrots, came across your recipe, and now am in LOVE WITH THEM! Thank you, thank you. It’s so nice to find delicious healthy alternatives to my food addition. I am going to make these today, to take on a 2 week hunting/camping trip. I will need to freeze a good number of them. Would you frost before freezing, or after? Thanks!